Like with most facets of life, our diet is subject to change. While the guidelines of Happy Body Formula and the 7 Day Make Ahead Meal Plan could very well work for people of all ages, we have to be mindful of what our bodies need as time goes on. In order to ensure longevity – and not just that, but a healthy life – we have to be sensitive to our bodies ever-changing needs. Graceful aging is made possible by nutrition, proper exercise, sleep and stress-management. Over time, we have to adjust accordingly to accommodate our physical and biological needs. Different decades of our life can benefit from a little extra attention. These are the foods you should be eating to age-proof your diet and live your best life, no matter what birthday is around the corner. In your 20’s, you might still be thinking you’re quite invincible. While you’ve hopefully got plenty of time left, eating well now will definitely pay off later. Your twenties bring on a lot of change as you establish your life – careers, marriages, houses, kids and finances are huge themes during this time. Thus, the 20-somethings are facing some seriously stressful adjustment periods! Here are some traps you should try to avoid. Excuses, excuses! The 20’s are a time of rapid development, and we’re often pretty darn busy making moves so that we can finally settle down a bit. It seems like one big thing happens, and then we’re on to the next. We hardly leave time in the day to breathe let alone cook and eat healthy meals. The solution? For one, we are big proponents of meal prep! Downloading our 7 Day Make Ahead Meal Plan is a great step to get in the swing of making your food ahead of time. With just one day of cooking, you can easily have nutritious choices on hand for eating at home or on-the-go making the, “I have no time” excuse invalid. Easy choices such as boiled eggs, tinned fish, avocado, raw fruits and veggies, good quality pre-made soups and pre-packed salads are a simple way to ensure that your meals are balanced and energizing without being time-consuming. When you’re in your 20’s, you’re well past growing pains and puberty, but your body is still under construction. Your skeleton is still growing, and bone health is more important than ever. Keeping your bones well-fed now will pay off later, as the rest of the aging process includes natural deterioration of bone strength. The solution? Calcium, of course! While dairy is often viewed as the holy grail of what is optimal to maintain bone density as we age, the list goes far beyond a glass of milk. Incorporate more calcium-rich foods like sesame seeds (or tahini), sardines, and leafy greens like collards and spinach. Fermented dairy also includes calcium with less potential for negative reactions; eat yoghurt and cheese in place of dairy milk. Just as important are vitamins D and K as they work together with calcium to make sure your bones are strong and healthy. Eggs, meats and seafood, and plenty of sunshine, will supply you with the right dose of Ds; while aged cheese, leafy greens and other vegetables will boost your Ks. We’re not the “fun police” , but we can say that your liver needs proper love and care to process those jugs of margaritas and vodka shots. The more strain you put on your liver, the less efficient it will be in performing its intended functions such as filtering and flushing out the toxins in your body. Too much alcohol can also pack on a few unexpected pounds and affect your gut health. The solution? Opt for good quality wine and clear spirits without the sweet mixers, and don’t forget to drink plenty of water in between. Drinking a glass of warm water with lemon juice every morning will give your liver a helping hand; so will eating plenty of cruciferous vegetables (such as broccoli and cabbage), and foods high in sulphur (think onion, garlic, eggs, and leafy greens). Fighting a hangover? Ditch the greasy burger in favor of freshly squeezed juices (we love beetroot, carrot, apple and ginger) and a plate of poached eggs with grilled salmon. A cup of full-fat, unsweetened yoghurt is also a good idea! Protein will keep you satiated and provide the building blocks to build and maintain your muscles. Aim for 60 to 100 grams of protein a day. Calcium, vitamin D and vitamin K are essential for strong and healthy bones. Potassium is often forgotten, yet it helps your muscles and heart to function properly. Focus on a variety of fruits and vegetable for your potassium needs. Women in their 20’s are particularly susceptible to depression, so it’s a good idea to feed your brain with some feel-good foods such as Omega-3s rich salmon and tuna, as well as flaxseed, walnuts and dark chocolate. Ah, finally! We’ve gotten to the light at the end of the tunnel that is our twenties – but what now? While you may be prioritizing ‘me’ time and allowing yourself to de-stress with yoga and meditation sessions, new struggles will begin to pop up. The days of energetic youth are dwindling, and you can kinda, sorta feel it. Maybe you notice yourself dragging your feet more, or perhaps getting out of bed in the morning with any glimmer of enthusiasm is nearly impossible. Maybe those milestones from your 20’s are still hitting hard into your 30’s, and the stress has just become something of a chronic symptom – it happens. The solution? Addressing chronic stress via diet is an important factor to fight off fatigue. It’s good to load up on foods with immune-boosting properties as stress can wear down our body’s ability to fight. Eat foods rich with vitamin E such as almonds, leafy greens and raw seeds. 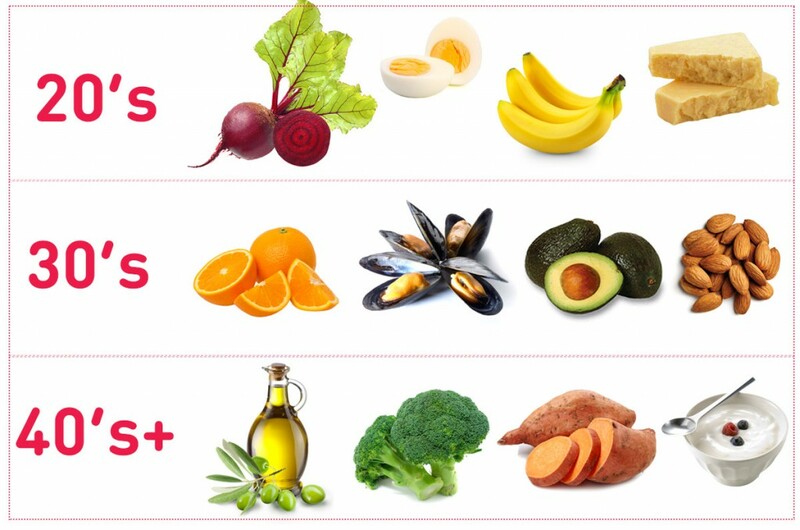 It’s also important to get B vitamins which aid in the body producing an effective physical response to stress – think liver, poultry, seafood and bananas. That’s all there is to it, really. Our best advice is to embrace the aging process, including the obvious physical changes. Self-love is something we value above all. Fortunately, there are a few ways to avoid deep and excessive lining on the face. We can’t fight it off entirely, but nutrition plays a huge role in these facially formative years. The solution? Eat foods that are great for your skin! It is the largest cell in the body, after all, and a proper supply of nutrients helps that cell rebuild. Here’s a list of the ten essential nutrients you should be getting. One example is silica which is vital for collagen production; this helps our skin stay plump and smooth. You can find this nutrient in fruits like apples and oranges. Another essential nutrient is zinc which helps protect our skin from sun damage. You can get this in oysters, pecans and mushrooms. Gelatin is great for your skin and hair as well, so get that bone broth simmering, or making some healthy fruit jelly for dessert. As well as the nutrients we mentioned above, it’s important to get plenty of folate, which is critical for a healthy pregnancy and helping your body make new cells. Folate may also help reduce the risk of heart disease. Stock up on asparagus (also great for regulating hormones), spinach, avocados, broccoli, oranges and properly cooked chickpeas. Phytonutrients – think antioxidants – help to slow down the clock, ward off heart disease and protect you against cancer. In addition to eating plenty of colorful fruits and vegetables, you should include some dark chocolate, red wine and coffee, which are high in these compounds. If you’re feeling mentally and physically drained, you might be running low on iron. Add some beef, shellfish, poultry, kale and pumpkin seeds to your diet to get an iron boost. It’s obvious that we have to take care of our body’s most important muscle. This is especially true in your 40’s and the years that come after that. By feeding and exercising our minds properly, we do a lot in the way of warding off degenerative diseases like Alzheimer’s. Moreover, our brain is responsible for our bodies, so it’s best to start from the ground up. The solution? The brain thrives on real food, and the body follows suit. Certain nutrients are good in terms of delivering proper amounts of oxygen to the brain and protecting neurons which in turn ward off rapid deterioration of the brain. Foods like beets, olive oil and walnuts have some serious brain-boosting properties including antioxidants, vitamin E, and natural nitrates. Read more about 10 foods you should be eating for your brain. While you should still be hitting the gym – including weights or resistance training – well into your later years, your body is less likely to want to hold on to all that muscle. In fact, our bodies are more keen to storing fat the older we get. Putting on muscle is difficult in the first place, but as we creep into the 40’s and beyond, it gets even harder. The solution? Getting enough protein helps immensely. Check out our handy muscle building nutrition cheat sheet for the approximate amount of protein you should be getting, and the best ways to pack it into your diet. This helps the muscles both grow and repair, keeping them strong. While you may have trouble adding muscle mass later in life, regular exercise and proper diet ensures that you can maintain what you’re already working with while slowly building on a healthy foundation. As we get older, our heart and arteries will need more attention. Focus on anti-inflammatory foods that help to lower the ‘bad’ LDL cholesterol such as antioxidant-rich red grapes and red wine, Omega-3 rich oily fish and seafood, foods high in fibre such as sweet potatoes, celery, carrots and buckwheat, and healthy fats from avocados and olive oil. Avoiding refined carbohydrates and excess sugar while keeping your stress levels down will also help to keep the inflammation down. To keep your vision from weakening, go wild with greens – broccoli, spinach, zucchini and kale – which are high in lutein and zeaxanthin, two antioxidants that help to protect your eyes from UV damage. 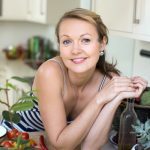 Finally, as you approach menopause and bone-building estrogen starts to decline, calcium and vitamin D will become even more important; make sure you get plenty of aged cheese and full-fat yoghurt, eggs, sardines, sesame seeds, meats and seafood. What do you do to eat for your age? Tell us below! Share this with your friends of all ages! Pin from later from here. We kind of lumped a 50s and 60s into 40s+ category, but I am sure there are some special requirements for once you go over 60s and we should definitely include more info 🙂 Maybe even a separate post.